Designed, built and tested to the highest standards by our multi award winning team, the 3XS Vengeance RTX Ti features a high performance 11GB EVGA GeForce RTX 2080 Ti XC GAMING graphics card for superb 4K performance in games and VR. We have paired this powerful GPU configuration with Intel's brand new 9th generation “Coffee Lake” Core i9 9900K eight core CPU that we have professionally overclocked to a staggering 4.9GHz across all cores. The system also includes 16GB of Corsair Vengeance LPX 3000MHz DDR4, an ASUS ROG STRIX Z390-F GAMING motherboard, a 500GB Samsung 970 EVO PLUS M.2 SSD for lightning quick loading times and file transfer and a 2TB hard disk for storage. We professionally tweak this system to keep temperatures and noise levels down to a minimum and our engineers have managed to perfect the balance between acoustics and performance. . The 3XS Vengeance RTX Ti is pre-built and ready to ship for next-day delivery and comes with Windows 10 Home pre-installed and a premium 3-year warranty. 3XS Vengeance RTX Ti, Overclocked Intel Core i9 9900K "Coffee Lake", 16GB DDR4, 11GB EVGA RTX 2080 Ti, 500GB SSD, 2TB is rated 5.0 out of 5 by 3. Rated 5 out of 5 by Marcho from Put simply, awesome computer Being a big fan of simulation and first person games this computer ran my favorites on ultra or epic settings, no problem. The computer was built over Christmas holidays and arrived via courier packaged in bubble film packed outer box, the computer itself packed full with pink bubble film sheets to maintain parts don't become unseated. Unpacked and connected my monitor, speakers, etc. turning it on. I've not looked back. Awesome piece of kit. Rated 5 out of 5 by AnonymousPurchaser from As good as it gets. TL;DR: Better and faster than doing it yourself, gauranteed. Where do I start? + Cable Management inside both front and back is impeccable. + You are kept in touch with the build process. + The cost difference between individual parts and unit price is neglibile, especially when you consider the effort 3XS put in. + Packaging is brilliant, everything that comes with the PC is neatly stored alongside the manuals. + Considerate enough to include some of the packaging such as the processor case. + You even get a free hat, mug, mousemat and more! 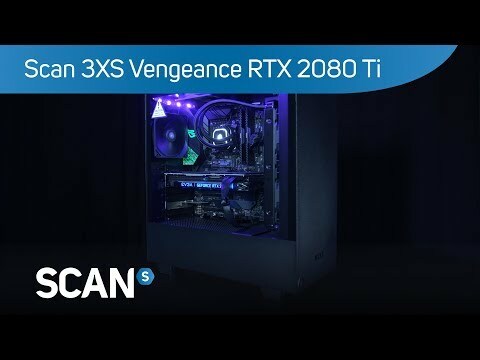 Having built several PC's myself over the years I can attest to the high standards that the 3XS team have put into this pre-built, they've went beyond what's necessary and delivered something very special. Words really don't their effort justice, the amount of care that has been taken is amazing. Rated 5 out of 5 by FIREFLYAD from Fantastic customer service I lost count how many times my teenage son changed his mind on what he wanted but the team at Scan were always happy to accommodate his wishes. Also very quick to respond to email enquiries, with a phone call if necessary. Very happy to recommend the Scan team and their products. How is the RAM configured in the PC? If I was to buy this system when it comes out would I be able to upgrade the ram as I purchase it so I wouldn't have to install any sticks myself?